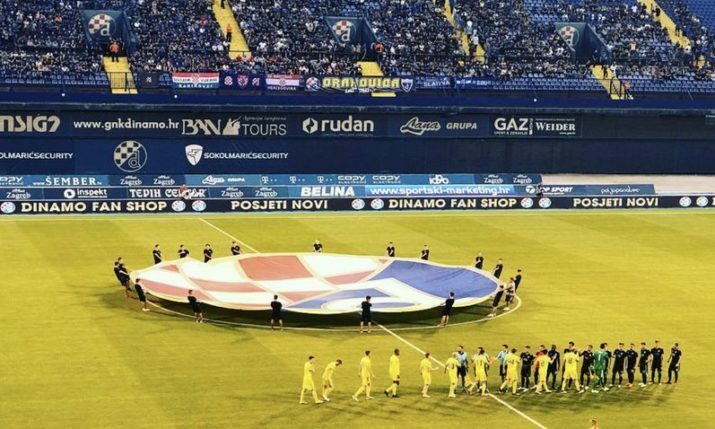 Dinamo Zagreb will play in European competition in winter for the first time in 49 years after securing a spot in the last 32 of the UEFA Europa League. Dinamo Zagreb continued their unbeaten streak in the UEFA Europa League on Thursday night in front of a sold out Maksimir stadium in Zagreb with a 3-1 win against Slovakian side Spartak Trnava. The result means Dinamo Zagreb advances to the knockout phase, the first time this has happened in European competition since 1970 when they reached the quarterfinals of the Cup Winners’ Cup. Dinamo has been in great form in Europe this season, beating Fenerbache, Anderlecht and Spartak Trnava before tonight’s match. The match, which was sold out a week ago, was played in heavy fog with even talk a couple hours before kick-off that the game could get postponed. Amer Gojak opened the scoring in the 22nd minute before the fog thickened forcing the referee to change the ball to an orange couloured ball. Dinamo, who were dominant and in attacking mode, went 2-o up when Spartak Trnava’s Kadlec put the ball into his own net. Dinamo had chances to score at least three more before the visitors pulled one back in the 63rd minute through Čanturišvili. Mislav Oršić made sure there would be no doubt about the victory when he scored for the hosts with 10 minutes to go. Dinamo has two more matches against Anderlecht at home and Fenerbache away before the knockout phase starts. The four best third-placed teams from the Champions League group stage join the top two teams from each Europa League group in the draw on 17 December.